Adele Gagliardi is the Administrator for the Employment and Training Administration (ETA) Office of Policy, Development and Research (OPDR). 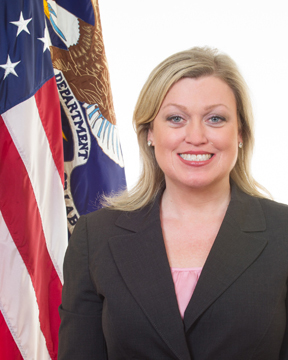 As OPDR Administrator, she is responsible for overseeing the assessment and development of employment and training policies, managing the design of the agency's research and demonstration program, providing direct support to agency budget and appropriation activities, managing performance accountability reporting and disseminating program performance results to inform policy and program decision making. In addition, she coordinates the agency's legislative and regulatory agendas and development of proposals, as well as international engagements and information exchanges. Ms. Gagliardi was previously the Regional Director for the Office of State Systems in ETA Region 5, which includes: Illinois, Indiana, Iowa, Kansas, Michigan, Missouri, Minnesota, Nebraska, Ohio and Wisconsin. That office is responsible overseeing ETA grants to states for ETA administered employment and training programs and the federal component of the Unemployment Insurance program. In this capacity, she worked collaboratively with workforce system partners to support and promote workforce solutions which meet the needs of employers, workers, and communities. Prior to her position as Regional Director, she served as the Division Director for Policy, Legislation and Regulation in OPDR. She oversaw and conducted the analysis and formulated recommendations for legislative changes and policy initiatives for workforce programs. In addition, she coordinated the development of ETA regulations and liaison responsibilities with external entities such as the Government Accountability Office. Ms. Gagliardi has held several other roles within the agency, including participating in a year-long international learning exchange with Human Resources Social Development Canada. She began her career at ETA as a Presidential Management Fellow, and is a proud graduate of Wayne State University Law School and of Michigan State University and a member of the American Bar Association and the State Bar of Michigan.